Generously coated in warming spices and roasted to delicious golden perfection. Don’t skip the spicy dipping sauce! For me, this time of year is simultaneously wonderful and, well, kind of tough. I love the idea of cozying up and basically straight-up hibernating – and I love it a little more every year. Last winter, I learned all about the Danish concept of Hygge and suddenly the whole idea of cocooning and cozying up etc. felt legit. But for an introvert like myself, the impending winter can also be an excuse to stay home instead of dragging myself out to do social stuff. To a fault. That, combined with the complete lack of vitamin D available in the Pacific Northwest between October and April, can send me easily into a bit of a spiral. So, my goal is this year is balance. Plenty of cozying up and embracing this dark and stormy season, but also faithfully popping my vitamin D supplement, getting outside whenever I can, and dragging my rear out of the house to see friends as often as possible. I suppose this line of thought doesn’t have much to do with these baked butternut squash fries, except for the fact that both things happen in the fall and winter. 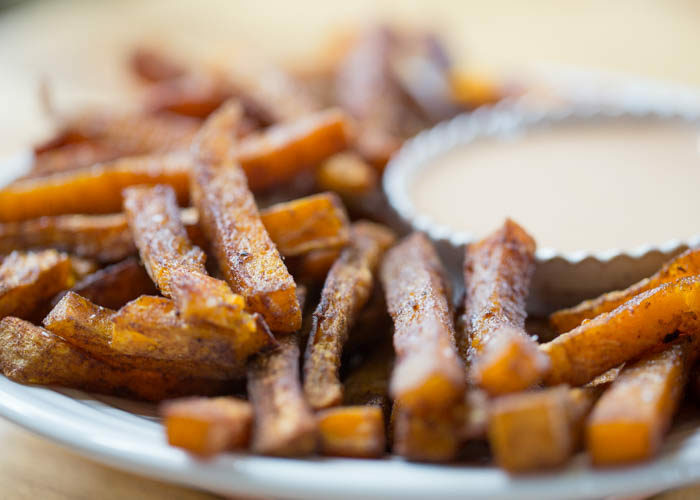 I will say that butternut squash fries are definitely one of those things that lands on the positive side of the winter equation, however. They’re especially delicious eaten cozied up in a blanket in front of the fire. Just saying. Now, these fries are not crispy, except for a few magical end pieces here and there. They’re not even very rigid – many of them are a bit fragile and bend and break. PLEASE DON’T LET THIS STOP YOU FROM TRYING THEM! 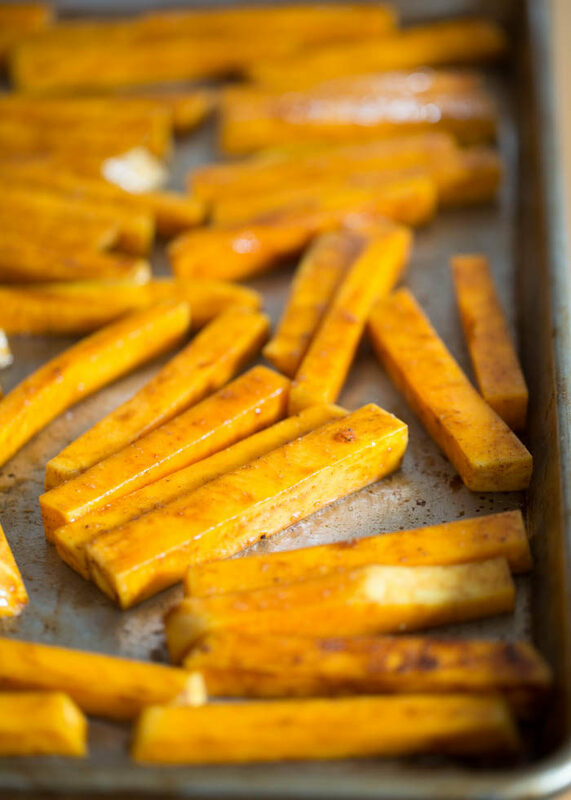 Oven-baked butternut squash fries are absolutely delicious, just as they are. Okay, even more so when coated in Chinese five-spice blend as they are here. Chinese five-spice is a blend of warming spices such as anise, star anise, nutmeg, cloves, and ginger, or sometimes cinnamon, Sichuan peppercorns, or even fennel. 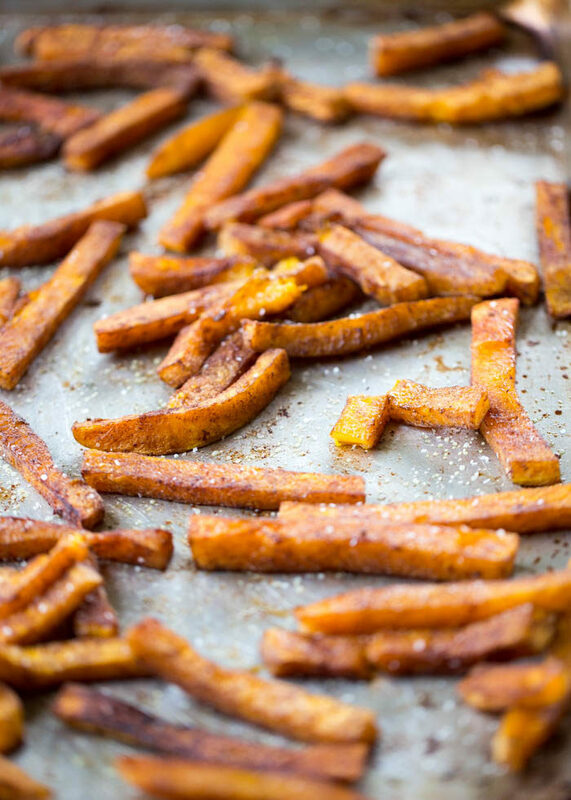 Perfect fall and winter flavors if you ask me – and ideal with roasted butternut squash. I wanted to keep these on the healthy side, but every time I tried them, I just couldn’t get over the fact that they really call for a creamy, dreamy dipping sauce. So I broke out the mayo and I do not regret it one bit. 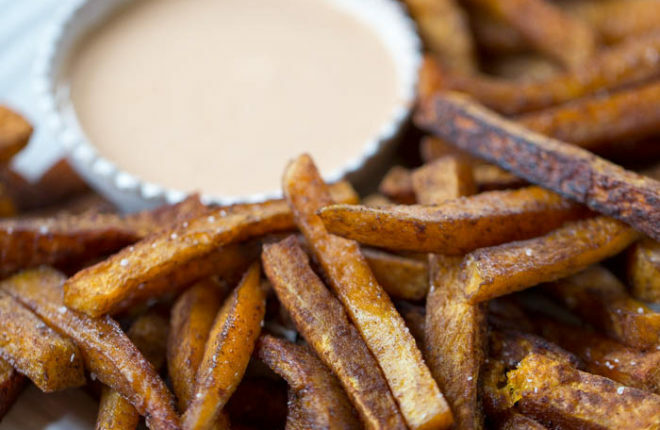 The sauce is simply mayo, Sriracha, and Tamari, and it’s the perfect companion to these fries. If I’m watching my portion control, I might just drizzle a tablespoon of the dipping sauce over a bit plate of these instead of serving the dip alongside. Or I might just go for it. Preheat oven to 400 degrees Fahrenheit. Set out a large rimmed cookie sheet. 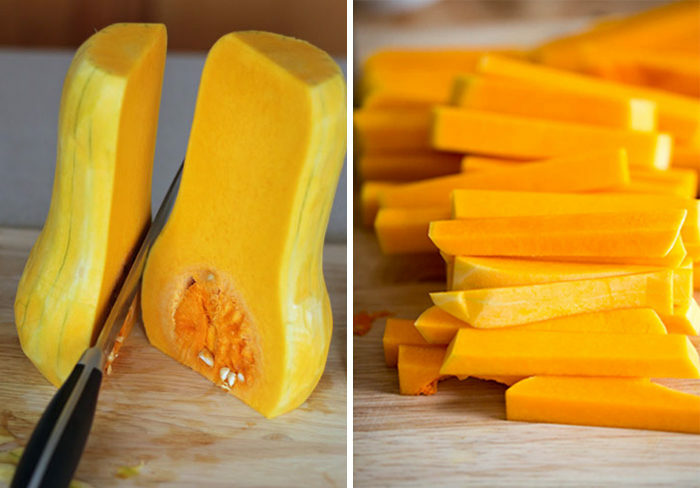 Place cut butternut squash into a large bowl and drizzle with olive oil. Sprinkle with 5-spice blend, 1 teaspoon kosher salt, and black pepper. Use clean fingers to toss well, making sure each piece is coated with olive oil and spices. Pour onto cookie sheet and spread into a single layer. Try to make sure there’s a bit of space around each piece; if you need to divide the fries between two cookie sheets, that’s fine. Bake until tender and golden, about 40 minutes, carefully tossing 2-3 times while baking (they’ll be a bit fragile). 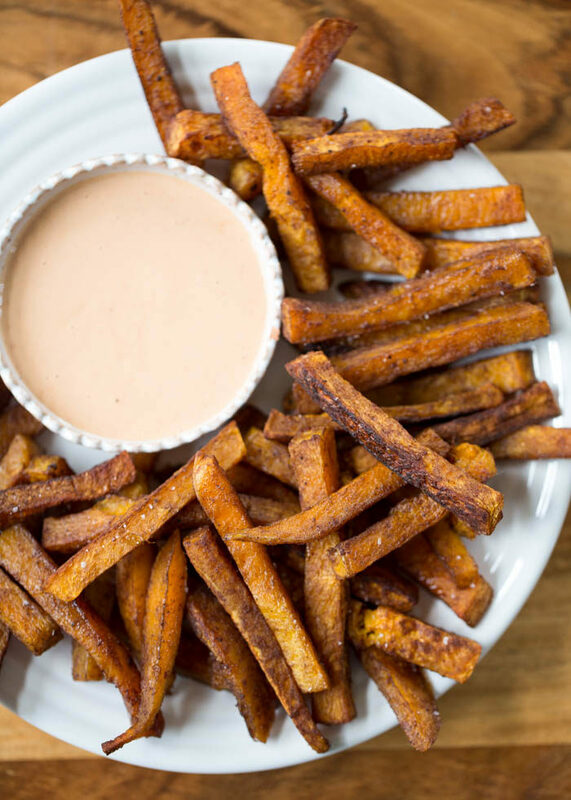 While the fries bake, make the Spicy Sriracha Dipping Sauce. To a small bowl, add the mayo, Sriracha, and Tamari. Mix with a small whisk or fork until smooth. 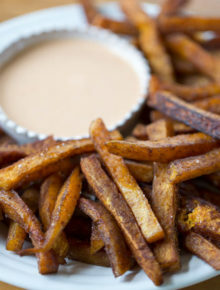 Serve fries right away with the dipping sauce alongside.